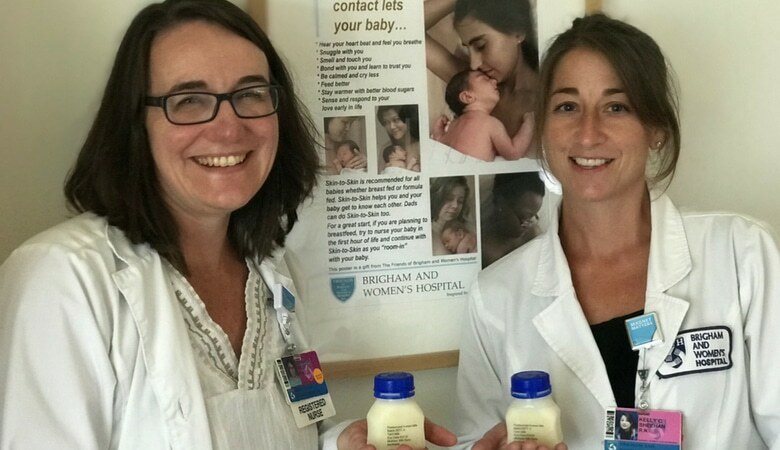 Brigham and Women’s Hospital began offering pasteurized donor human milk in its postpartum unit in 2015, after having started in the NICU in 2011. Hospitals like Brigham and Women’s often find that donor milk is an important, life-saving service for all of the tiniest patients. While it prevents necrotizing enterocolitis and other prematurity-related diseases in the NICU, it also serves as an important bridge to breastfeeding initiation for full-term babies. This helps hospitals meet their desired exclusive breast milk feeding goals as reported to the Joint Commission and most importantly, helps mothers and babies get off to their best start. Brigham and Women’s Hospital started using donor milk in the NICU in 2011 and in the postpartum unit in 2013. That same year they started on the pathway of the Baby-Friendly Hospital Initiative. In 2015, Brigham and Women’s designated a separate postpartum donor milk program. The program’s first funding came from families who had graduated from the hospital’s NICU and wanted to support hospital programs as a way of expressing their appreciation. The postpartum unit continues to receive donor milk funding through grant and discretionary funds but with 6,200 births annually, their goal is to ultimately incorporate it into the unit’s budget. In another happy circumstance, a family was so grateful that they reconnected after a few months of leaving the hospital and donated $1,000 to the donor milk grant fund. They had gone home with some bottles of donor milk on hand to use as a bridge to breastfeeding but ended up having leftover milk because the mother had successfully established her milk supply. Another helpful tool is that when hospitals implement the Baby-Friendly Hospital Initiative, physicians are required to apply some of their continuing education credits toward breastfeeding. “That too can help affirm the power of exclusive breast milk feeding and donor milk use,” said Jen. Brigham and Women’s Hospital has a Level III neonatal intensive care unit (NICU). Related surgeries are conducted at their partner, Boston Children’s Hospital, while the medical management of cases is conducted at Brigham and Women’s. Patients travel from all over the world for surgical care and medical management at the two hospitals. Brigham and Women’s has 30 labor rooms, six operating rooms, and 60 postpartum beds. The recently remodeled NICU can accommodate 60 infants, with private rooms to allow families to stay together 24 hours a day. The hospital heavily focuses on family-centered care. Last year, there were 6,200 births at Brigham and Women’s, making it the largest birthing hospital in the greater Boston area, a point of pride as a community-oriented university hospital that conducts research. Brigham and Women’s is part of the Partners HealthCare network, which includes multiple hospitals that provide birth services. The hospital is proud to have partners throughout New England who also use donor milk, such as Massachusetts General Hospital, Newton-Wellesley Hospital, and North Shore Medical Center. Jennifer Riley, RN, IBCLC, has been a nurse for 20 years and a board-certified lactation consultant for 12, working in postpartum care for most of that time. She started at Brigham and Women’s 15 years ago as a postpartum staff nurse. Jen is now a member of the postpartum unit’s lactation support services team, where she administers and advocates for the use of pasteurized donor human milk. She likely first heard about Mother’s Milk Bank Northeast through the Massachusetts Breastfeeding Coalition and the broader lactation community. She has served on the milk bank board for 2 years, and is currently president-elect, with her term starting in 2019. As someone using our services on the hospital floor, Jen brings a special perspective, as she can give other board members a sense of how mothers feel and what hospitals think about as they start up their donor milk programs. She is one of the milk bank’s top go-to people for questions on ensuring high-quality services to our hospital clients. Thank you, Jen, for all you do, and welcome to your incoming role as milk bank president!